Judge Hall was first elected to the District Court in 1996. She has been a Circuit Judge since February 2005. In January 2010, she was elected by her peers to serve as Presiding Judge of this Circuit. Under her leadership, working with other elected officials, attorneys and citizens, the Juvenile Justice Center was established and opened, the Madison County Law Library was modernized and renovated, the Court Administrator’s Office was restructured, additional funding for court/clerk personnel was secured and among other things, delivery of services to indigent citizens and courthouse security were evaluated and new procedures implemented. Judge Hall received her Doctor of Jurisprudence from Cumberland School of Law and her Bachelor of Arts from the University of Florida. 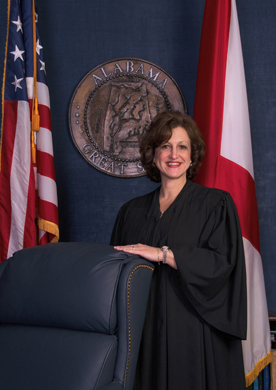 She is a distinguished member of the Alabama and Florida Bar Associations and the recipient of numerous honors and awards, including the 2010-11 King Solomon Award for Judicial Excellence, the 2000 National Association for Community Leadership’s Distinguished Leadership Award and the University of Florida’s Hall of Fame. She is also a member of the Board of Directors of the Alabama Association of Circuit Judges and has served as a member of boards, associations and committees throughout the community and State since 1986.